No plumbing; no maintenance labor and cost. For use on all types of pipes up to 1" diameter, including copper and PVC. The ClearWave™ is a revolutionary new product that works without salt, chemicals or changes to plumbing. The ClearWave conditions hard water to help dissolve existing scale and help prevent new scale from forming. It uses microprocessor technology to electronically generate inaudible waveforms which help keep calcium carbonate particles (scale) dissolved in water. This ClearWave treated water continues to dissolve scale as it flows downstream. Over time, the ClearWave helps solve hard water problems in the entire system, including pipes, water heater, shower heads and appliances. This easily installed device will solve the hard water problems in your entire house. Soon your entire water system is crystal clear, and your water is "softer." As the ClearWave solution takes effect, you'll notice that you use less soap and detergent. In summary, it provides all the benefits of natually soft water without the troublesome installation and cost of traditional ion-exchange water softners. Household Appliacations: dishwashers, washing machines, coffe makers, swimming pools, hot tubs and boilers. Industrial Applications: Ice factories, soft drink manufacturers, distilleries, poultry farms, paper and steel mills. Mount the ClearWave onto the pipe by routing a wire tie through the two holes on each end of the Clearwave housing base. Wrap the antenna minimum 7 times around the 1" water pipe on each end of the ClearWave (For pipes 1 1/4" to 1 1/2" use two units in series). 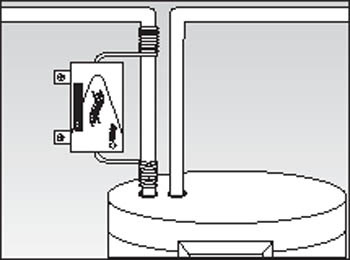 Make sure one antenna is wrapped clockwise and the other antenna is wrapped counter-clockwise. Secure the antenna wire tight against the pipe with a wire tie. Plug the power supply into a standard electrical wall outlet. When energized, the ClearWave Modulations indicator lights start flashing sequentially indicating that the ClearWave is functioning properly. Units can be combined and used in series for larger pipes. Day 1: The Clearwave action immediately starts to loosen existing scale on both the hot and cold systems. Day 16 and Onwards: scale should have softened on faucets, showerheads, and frequently used appliances such as coffee makers. With the continuing break down and reductions of scale from the heating surfaces of water heaters, water should heat up quicker using less energy. After 1 - 2 months: Any Scale Crust or stains in toilets or under facuets will have started to soften and will be easier to remove. No new stain or crust should form. ** Depending on the water hardness in your area, full effects can take up to 12 weeks, especially if the system has been heavily scaled over many years. * Made in USA with a 18 month manufacturer's warranty and 30 day satisfaction guarantee.